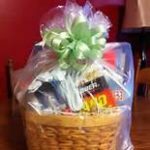 Small gift baskets are prepared and delivered to homebound members of the congregation several times a year including Easter, Thanksgiving, and Christmas. The baskets are a way to keep in touch with members who cannot attend worship regularly and provide the visitor with an opportunity to make a social call to a member who may feel isolated. Joy Peter coordinates the preparation and delivery of homebound baskets. Contact Joy Peter if you would like to help or make a donation for the baskets.